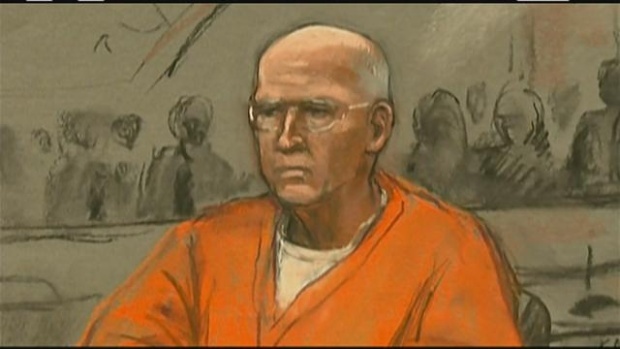 An artist rendering of Whitey Bulger from his trial in Boston. They want their Irish gangsters back! I can’t help but think that when I read the daily reports from the Boston trial of infamous kingpin James “Whitey” Bulger. As the search for Bulger dragged on, through the 1990s and 2000s, it was almost humorous to read the occasional update about this or that Whitey sighting, in Boston or Dublin or San Diego. Or at least as humorous as a reference to an alleged killer next to Osama bin Laden on the FBI’s Most Wanted list could be. Over those years, with Whitey on the run, the myth of the Boston Irish criminal grew by leaps and bounds. The likes of native sons such as Ben Affleck (The Town) and Mark Wahlberg (The Departed) cemented their star status by playing sinners or saints in the slew of Boston Irish criminal movies that hit the big screens. Liev Schreiber is just the latest star to exploit the Boston Irish mythos with his new Showtime series Ray Donovan, which transplants a Boston Irish tough guy and places him in sunny Los Angeles to solve the problems of the rich and famous. But this sense of traveling back in time didn’t really kick in until Tuesday, when I read that an ex-convict by the name of Kevin Patrick Smith was arrested following an FBI raid. Smith had planned to travel from Manhattan to upstate Ulster County, New York, to knock over a Wells Fargo in the college town of New Paltz. Turns out Kevin Patrick Smith was a member of a little group known as the Westies. Perhaps you’ve heard of them -- arguably the most feared and certainly most mythologized Irish gang of the 20th century. True, Reagan was in the White House when things started going south for the Westies. But as Kevin Patrick Smith’s arrest shows, some of these boys are still trying to get back into the business. Before the heist went down, the FBI arrested Smith at his Upper East Side home, which is where they found the “rob bank” note, according to the New York Post. Which raises the question -- what in the good Lord’s name is a Westie doing on the Upper East Side? More importantly, the Bulger trial and the arrest of a former Westie force us to confront the myth -- and the reality -- of the Irish gangster. One of the most truly surreal moments in the Bulger trial came when the alleged crime boss’ defense team acknowledged Bulger might have done a lot of bad things. But he simply never could have been a snitch, a rat, an informant, simply because Bulger is Irish American. "James Bulger never ever — the evidence will show — was an informant," attorney J.W. Carney told the jury, adding that being an informant was "the worst thing an Irish person could consider doing." This sentiment has been well-documented, from Liam O’Flaherty’s guilt-wracked protagonist in his novel (later a John Ford movie) entitled The Informer, right up to Mad Man John Hamm lamenting the “pitiable, misguided Irish Omerta” code of the bank robbers in The Town. If only real life was like the movies. In real life, snitches don’t always get stitches. Certainly, Westies such as Kevin Patrick Smith wish the Irish code of silence was as strong the movies make it seem. However, it was the Westies own Mickey Featherstone who, facing 25 years on a murder rap, decided to turn informant and sing about Westies top gun Jimmy Coonan. Featherstone went into the witness protection program. As for Whitey Bulger, many credible (and some downright sleazy) people are on record stating Bulger informed on criminals all over New England. This is what allowed him to live a nice life, even when it was time for him to go on the run. See? Sometimes snitches get their fair share of riches. Even if they are Irish.